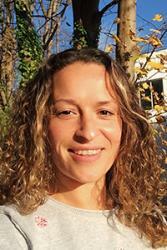 Dr Fran Garrad-ColeDr Frances Garrad-Cole of Bangor University’s School of Psychology is the latest member of University staff to be awarded an important Higher Education Academy (HEA) National Teaching Fellowship. A National Teaching Fellowship is the most prestigious individual award for excellence in teaching in higher education. Fran joins School of Psychology colleague Dr Fay Short and Peggy Murphy at the School of Healthcare Sciences in becoming a Fellow, and was nominated by the University. Dr Garrad-Cole is Deputy Head of School (Impact) and a Senior Lecturer in Psychology. She also works one day a week as a Teaching and Learning Developer in CELT, with Prof. Oliver Turnbull, the University’s Pro Vice Chancellor for Teaching and Learning, and is responsible for driving innovation and supporting development in Assessment and Feedback across the University. She is a Bangor University graduate, having achieved a BSc in Psychology and a PhD in Developmental Cognitive Psychology. The National Teaching Fellowship is run by the HEA on behalf of the award funders: the Higher Education Funding Council for England (HEFCE), the Higher Education Funding Council for Wales (HEFCW), and the Department for the Economy in Northern Ireland (DfE) and is open to staff whose teaching or support roles enhance the student learning experience.